Our nation’s debt is a glaring indicator of our society’s values. In general, we’re happy to borrow against our futures to enjoy what we want right now. Not everyone feels or acts this way, of course, but I think far too many people don’t spend enough time planning for the future. 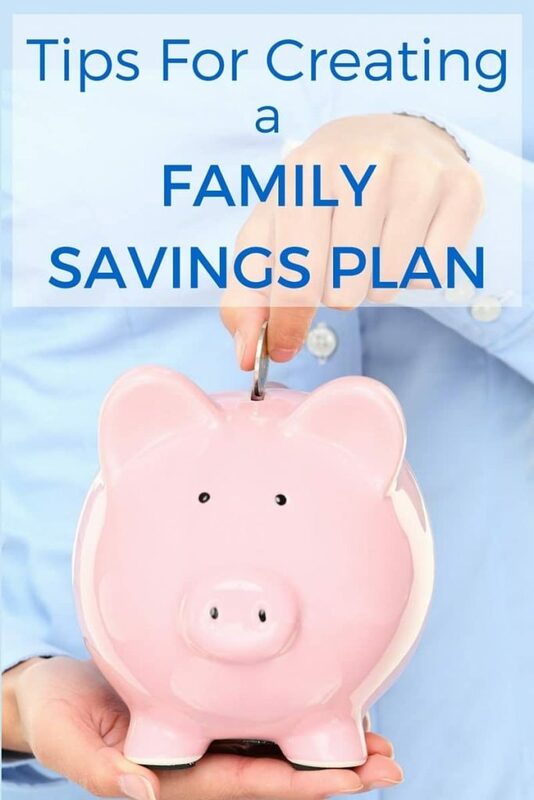 Today, I am sharing my tips for creating a family savings plan to make sure you and your family don’t fall into the trap of being unprepared for life’s unexpected twists and turns. Last week I shared my family’s Budget Worksheets. I use them to track my family’s spending and saving. One commenter mentioned that though she hasn’t used a budget in the past, due to expected changes in her financial circumstances, she is looking for some tools now to help her keep a tighter rein on her finances. Her comment reflected a very popular attitude that budgets are somehow only necessary for individuals who are struggling financially. I’d like to dispel that myth since I believe a budget, along with spending and savings goals, is essential no matter how much “disposable” income you have available. Why Do I Need a Family Savings Plan? If you’re like most people, you’d like to stop working someday. Ideally, you’ll have a comfortable retirement savings to draw from when that day arrives. Perhaps it’s important to you to be able to pay for or help your children pay for college one day. Who knows how long your car will run reliably? Are you prepared for a major unexpected expense like a new water heater or a medical emergency that is only partially covered by insurance? Even if you have a comfortable emergency fund, what if an amazing opportunity becomes available (e.g. your dream home goes on the market)? Do you have enough stashed away to leap on the opportunity? Most financial experts agree that before you consider other savings goals, you should establish an emergency fund that can cover all of your expenses for 3-6 months. This is the fund you will draw from if an unexpected expense pops up (e.g. your car breaks down and needs an expensive repair). This fund is also how you will cover your expenses if you should unexpectedly lose your job. Try to set aside a minimum of 10% of your income every month until you’ve reached your emergency fund savings goal. Think of your monthly savings allotment as a payment (e.g. like rent or utilities) that you MUST pay. Keep your emergency fund in a liquid account (e.g. savings account or money market account) that is separate from your regular checking/savings account so that you can easily access it in an emergency but won’t be tempted to tap into it for a non-essential splurge. If you’ve established your emergency fund, you’ll next want to set your sights on funding your retirement. I know, it seems like a long way off. Shouldn’t we prioritize something in the nearer future? You can, but then you’ll just have to be more disciplined later about beefing up your retirement account because the later your start, the more you have to save since you give up compound interest for the preceding years. Here’s a great article in Time that breaks down what percentage of your income you need to save at different ages in order to have enough money in retirement – “What Savings Rate You Need When Starting at Age 15, 25, 35, and 50.” Another reason to prioritze retirement savings over other savings goals is that in certain circumstances, you can borrow from your retirement account (ALWAYS consult a tax professional before doing this!). Save the maximum amount allowed by the IRS (or at least as much as you can). See contribution limits. If you aren’t an avid investor, choose a fund that redistributes over time to safer investments as you near retirement. Now it’s time to assess your short-term financial needs. In terms of savings goals, short term refers to money you will need in the next 1 to 3 years. Items that fall into this category might include: a new car, a family vacation, or a down payment on a house. Use a savings calculator so you can determine exactly how much you need to save each month in order to have exactly enough when you need it. Invest in Certificates of Deposits (CD’s) so you can access the money on your goal date but will be discouraged from accessing it beforehand. Shop around for the best rates on CD’s to get the most growth in your investment. Also consider money market accounts or high-yield savings accounts if they have better rates. If you want to help your child(ren) pay for college, it pays to start saving early. Last year the average cost of obtaining a 4-year degree at a public in-state university in the U.S. was $39,400. Most high school graduates aren’t going to earn that kind of money at their part-time jobs and not many parents have THAT much extra income (especially if they are diligently saving for retirement). For most families, paying for college will require some advance planning and saving. Encourage your children to contribute to their own education savings. Invest in a 529 plan. These plans give you the best tax advantages for college savings and many are very flexible. These components are key pieces in a comprehensive family savings plan. Don’t be discouraged if you struggle with finding a way to meet all of your savings goals. By making a plan you are already making progress towards a more secure future. So glad to hear that you’re encouraging everyone to save for their child’s college. This is definitely a large expense that can take some saving for. Great tips!